We were reminded of the different names of triangles such as Scalene, Isosceles and Equilateral triangles in this lesson. When Dr Yeap gave us the first problem: "Show 2 ways of showing 60 degree angle". It took me awhile to verify the ways as i took it for granted that 3 angles of a triangle is 180 degree and each angle is 60 degree. When he questioned "How would you know is 60 degree", i couldn't answer thinking aloud "Isn't it known that each angle in a triangle is 60 degree??" I like the idea of folding the triangle down so that all angles are in a straight line to be useful. This problem is tough for me handle. 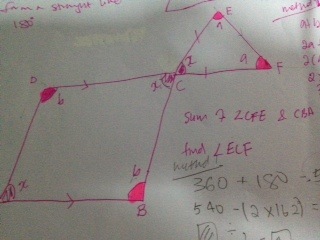 As what Dr Yeap mentioned, I lacked the "visualisation" that allows me to spot angle ADC and CEF to be 162 degrees too. It is a good recap for me to challenge myself!